Yesterday I worked on getting the doors and drawers for the kitchen peninsula finished, and also the corbels for the other two walls. I had hoped to have those things finished today so I could show you, but I didn’t quite get finished. I should have them finished by tomorrow. But that’s okay, because I have something far more exciting to show you! When I came in from painting last night, I grabbed my computer to check email. I was so stinkin’ excited when I opened several emails from a reader named Phyllis with several CAD drawings showing two possible front porch design ideas for my house. Phyllis worked in architecture for over a decade before leaving the field to be a stay-at-home mom and focus on her family. Now that her kids are grown, she’s considering re-entering the field of architecture, and wanted to test out a new (to her) CAD program before purchasing it. And lucky me, she used my house to give that CAD program a test drive!!! As a reminder, here’s how the front of my house looks now — a blank slate in need of some color and detail. The first drawing is the hip roof with the gable right above the front door. This is the option that I said in my last post was my favorite, but it’s pretty amazing to see it in an actual 3-D drawing rather than my sloppy cut-and-paste photoshopped version. Isn’t that awesome?! One of my favorite things is how she used the stone on the bases of the columns for the front porch. That’s such a brilliant idea, and actually, the two columns I have now were originally wrapped in Austin stone when the house was built. I’m not sure when or why the Austin stone was removed, but adding that detail back in will not only make the Austin stone make more sense and seem a bit more balanced, but it’ll also be in keeping with the house’s original design. Here’s an angled view from the garage side of the house. You’ll notice that the front porch doesn’t have a roof. Of course, in real life, it would have a roof. But since Phyllis was testing out a new CAD program, she wasn’t yet familiar with how to create some of those details. We can all use our imaginations, though. And then here’s a view from the other angle. This design doubles the depth of the original porch, and also includes a shallow porch (probably about 5 feet deep) in front of my office window. The second option that she created is this double gable roof. You’ll notice that the porch in this one doesn’t extend in front of my office window, but the rest of of the porch is twice the depth as the one we have now, so it’s 10 feet deep. Now see? This is the magic that a real architect can work. My double gable rendering had two very individual, disjointed gables. This double gable design looks so perfectly thought out and intentional. And here’s an angled view from the garage side of the house. And then looking back the other way. What I really love is how she added the siding above the back (larger) gable. That addition of siding to the stone part of the house, and then the addition of stone around the columns in front of the siding part of the house really makes everything feel more balanced. Because right now, I have no balance. I have stone on the left, siding on the right. Aren’t those amazing?! Even after staring at those for about 45 minutes last night, I still get a little giddy looking at them. I want to say a HUGE thank you to Phyllis for doing this! You have no idea how blessed and blown away I was when I opened those emails last night. That was so awesome of Phyllis!!! What a great person. Two huge thumbs up to her. I am so excited and giddy and it’s not even my house. I love the second one best! Of course, both are beautiful. Oops! My bad… I entered my comment as a reply to the comment by Becky (sorry Becky) instead of posting an original comment… Sorry. Second one gets my vote!!!! I love the second one! Just beautiful with Craftsman feel! My goodness…those are amazing!!! I think I like the second one best. It makes your front porch “pop” and seems to give you, and Matt, plenty of room to utilize your outdoor space. I love the 2nd one too! It gives so much balance and charactor to the house. That’s amazing! Phyllis ROCKS! You can’t go wrong with either, they are both beautiful. My eye however is more drawn to #1, I like the wider patio expanse and the columns are just gorgeous. When I saw #1 I thought , this is the one, but #2 is the one I pick. It looks so balanced and beautiful! Whatever you end up with will be amazing. Oh man – I will be of no help to you here because I like both! You might want to consider the lighting in your office – having the roof of the porch extend past your office window will make that room darker. Also consider how you might use the front porch – I love a big front porch, but if you are more likely to sit out back in that huge back yard, are you just asking for a space to put furniture and have it get dusty? Definately can’t go wrong here – both are beatiful! I agree with Kim, I would be hesitant to block the natural light from your office window. Especially since the small narrow slice of patio in front of it wouldn’t be utilized anyway. I vote for #2! I like #1 best too. My favorite is the second option. It seems to keep the style of the home. Very nice option! They’re both fabulous, but I think I like the second one best. I like the idea of having the space be deeper. I like the second one best, but they are both awesome. I will be patiently watching as you work your magic on your home. Both are absolutely beautiful but I think the second one is my personal favourite. Phyllis, you do lovely work. I agree & vote #2. I definitely like the second one better. It pulls everything together so much better. In the first one, all I saw was too many big white triangular shaped columns. I found them distracting from the rest of the house. They are both good looking porches, props to Phyllis! My vote goes to the second porch. I really love them both, but have to go with the second one. It just looks so dang classy! What a lovely surprise for you, and how nice of Phyllis to do this. I was sure I loved the first one, until I saw the second one! Definitely love the second one more. It seems like the perfect choice for your home’s style and the era in which it was built. Love it! I’m torn! The double gable is GORGEOUS but the four columns are beautiful too! Glad its not my decision! Kristi your home is going to be amazing!!!! They are both awesome. Phyllis did a great job. But the 2nd one is my favorite. They both are beautiful! What a wonderful email to receive! I like the second one the best. It adds so much dimension and height to the house! I really like the second one the best. You have the nicest readers–how nice of you, Phyllis. I vote for #2–it give your home such depth and adds such architectural interest. I love love love the second one! I like the double gable best. Seems to fit the exiting style of your house better. Overall I think it has more presence, a cleaner look inside around the ceilings. And just 2 columns makes the entire additions look in harmony where the other one seems to be more about the porch and columns. I also really like that access door to your office. I know you talked about doing away with it, but I find it to be “the unexpected” and adorable. Maybe you would too if it had a screen door so you could open it while working on your computer and enjoy the view to a lovely sitting area. I’m sure the porch will be decked out to the 9’s just like the inside. Fabulous drawings… what a treat! I like #2 best. I also like the idea of having the access door from the outside into your office. The idea of a screen door is nice but only if you are going to use a Phantom (roller type) Screen Door. Regular screen doors cover up beautiful front doors. Not sure if you plan to do a designing business from your home but having access right into your office would be nice for clients to enter. Just a thought. Both are beautiful! Tough choice. Love the 2nd one! Love it! Wow. Great Job Phyllis! I love love love the double gable design. It looks incredible! I absolutely LOVE the second one! I love the 2nd one!! Makes it looks like a beautiful city bungalow. Congratulations to Phyllis because they are both spectacular! My choice would be the second one. I love porches, but find that they can make the interior of a home so dark all the time and not allow sunshine in the rooms that abut the porch. For this reason, I like the second one because you would have sunshine in your office which will keep you motivated!! I agree with Linda as far as the allowing the light in the office. #2 is my vote. Love the second one. Somehow I can better see that one decorated for the holidays. How nice of her to do that for you! What an awesome surprise! I really, really love the first option with the hip roof. On option two, the gables seem too deep or a little out of proportion. I like both but think the 2nd one looks best with your style of home. #1 is my choice. #2, while beautiful, will not allow as much natural light in. Not really accurate as the office window will not be under cover and the living room was already under the porch overhang so it won’t make much difference at all there. I love #1 It is exactly what I’ve been trying to tell my husband we need for our manufactured house to give it character. Does Phyllis have a blog so I can contact her? Both are beautiful but I think I prefer number 2. The second choice! It looks sooo Southern. I seem to be in the minority but I really like rendering #1. Wow! How lovely! Phyllis is wonderful for making these CAD’s for you. But, you are so wonderful for sharing all that you do with us, so you totally deserve this! I must say my fav is #2. (although both are almost perfect so you can’t really go wrong with either!” The reason #2 is my favorite is twofold. First I think having a larger porch is safer for Matt. He will have room to move about in his chair more easily. Second I fear the porch over your office will cut out too much natural light. Also having a larger porch to just sit with family and friends and enjoy nature is just icing on the cake. All of these thoughts are rather minor though and I think both renderings are STUNNING. Again props to Phyllis! So hopefully we will soon see your and Matts choice! I LOVE number 2. I’m much like the others, in that I was so impressed with number 1…until I saw the second one. Number 2 just looks like it was always meant to be that way. It looks gracious and inviting. Sheila, gives some great reasons for number 2, especially the fact that it would be so much easier to navigate for Matt. He would have room to turn his wheelchair around in that much space. My daughter lives in the country in the DFW region of Texas. She has a porch that is that wide, and she says that the porch is her favorite room in the house. It is also the favorite of all her guests. Though the rest of her house is beautiful and welcoming, the porch is the place where everyone gathers when there is a group. In a quiet neighborhood like yours, I think you would absolutely love a big porch.. What direction does your house face? I’ve always though it faced North for some reason. Both are fabulous but I seem to l like the second one more. 2nd one… and what a sweet thing for her to do. So in that case, I’ll vote for the second one. It looks amazing with your front! What great visualizations! I can see your ideas much more clearly now. I think which you choose should depend on how you think you’ll use the porch. Do you want a long, traditional porch than you can have a couple of seating areas on, and wave to the neighbors as they walk by? Or do you you want a big square space that Matt can easily maneuver in? Are you a fan of having that extra shade at your office window, or would you rather have the sunlight in the office? I think the second design LOOKS more appealing. The first option! The simpler version seems to suit the house. Double gable > columns. I really love the second one. I don’t think you can go wrong with either one. However, I am a porch junkie and LOVE the second option. 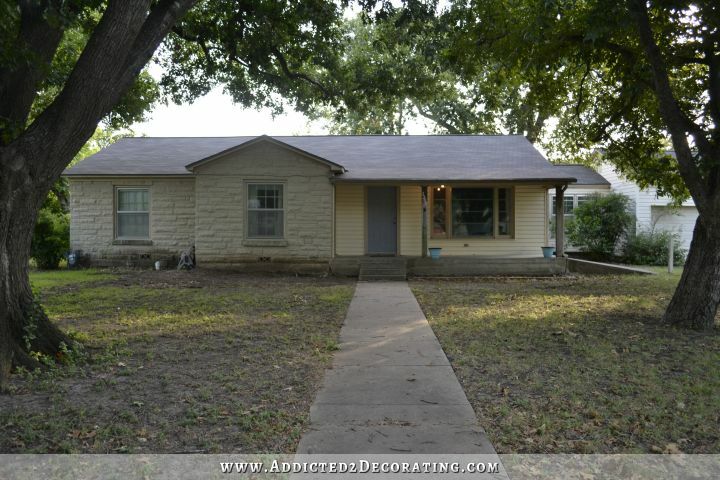 Just think of all you can do on and with that porch….and it will be nice with the hot Texas sun. Wow, the second one blew me away! How could you not do it?! I’m currently re-thinking my front entry-I need Phyllis! Great drawings! I pick #2. I think the second one is my favorite…can’t wait to hear your choice! I like both of them, but love the second one! Also like how the ramp has a railing in both and you really can’t tell it’s a ramp! Looks like part of the porch. Necessary to have but love how it’s comes from the driveway. What a nice blog reader/fan you have!! Looking forward to see who the winner is!! Love the second one, because I could easily see a great seating area where people could sit and speak to one another. Also would be great for a porch swing, and maybe allow more room for Matt to sit on the porch. What a wonderful gift! I like them both, but I like the second one best. If you’re anything like me, the deciding factor will be difference in cost. What a great gift to get!!!!! I vote for #2. #2 seems more inviting and open. Definite curb apeal! LOVE the double-gable option! Both are great but I love the deeper porch and the way the side porch and ramp feel like a design-feature instead of a necessity. Either one is great and how nice of Phyllis to ‘practice’ on you! Way to pay it forward, Phyllis! The second one. It suites the style of your house better. But either one would look great! I like the second one best. It just seems to look more natural, like the house was always meant to be that way. How exciting for you! Wow! SO lovely of Phyllis to do this for you. I personally like the second one! The second one. Love the depth of that one! I liked # 1 and then saw 2 then rechecked again #2 for sure the roof lines seem easier to build and the double gables give it depth not a flat facade. When we added a porch to our cape cod, we discovered the living room was so much cooler in the summer. I dreamt of a porch for years and my family thought I was crazy but I kept the picture for years. Finally, we did it. Well everyone loved it. They said it made the house. Years later styles changed and now we decided to change the railings again and it changed the whole look of the house. A front porch has been so much fun to decorate and change. Our neighbor was looking to buy a house and got excited by the porch only to discover her house was across the street. Thirteen years later she longs for a porch on her house. She said it helps to at least to be able to see ours out her window. Who knew a simple porch would bring joy for so many years. Enjoy yours. The second one! ALL DAY LONG!!! I like the 2nd one better! I would so love a porch at my house. The second one. You will enjoy the extra space it has to offer. Option 2 is my favorite. So much demension and character. It is simply stunning! Double gables ALL THE WAY! It looks so beautiful! #2 #2 #2!!! #2 for sure. Absolutely love it. Wow how amazing and generous of Phyllis!! And she did a fabulous job as both are gorgeous. Definitely the second one with the double gables!!! It makes the house so much more interesting architecturally. The bigger porch is nice too, but the roof line makes the house look less like a plain box. I love love love the second one!! What a wonderful, thoughtful gift that was! I prefer #2, but both are great. #2 makes the house look taller and more majestic. I love both but the second one is my favorite. #1 – and Phyllis – you’re awesome! Love the second one best! Has a more Craftsman look which I think suits the house better! What an awesome gift! 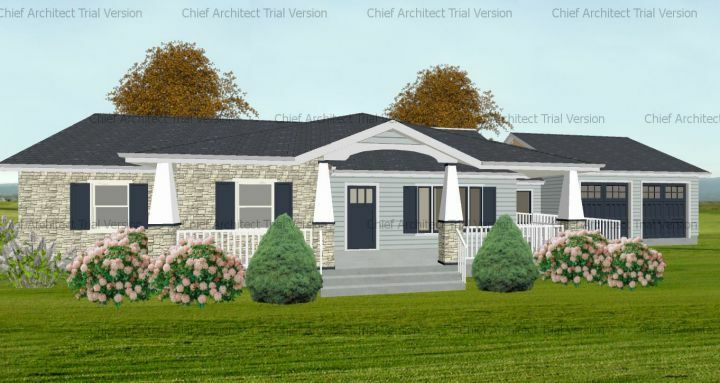 In the original mock-up I was sure I liked the larger porch of option 1, but now seeing this I’m really loving option 2. It looks a lot more natural to the house, and I love the architectural detail/interest of the 2 gabled roofs. Awesome! Both are beautiful, but to me the 2nd version is so open and really balances with the rest of the house. I would vote #2! 🙂 Either way is a win…wonderful to have great readers, ready to share their talents. I like the second one the best. Although I love large porches and would normally choose option one, the roof line of the second option compliments your house so much more. What a wonderful thing for Phyllis to do! To be able to visualize this makes all the difference. I love them both for different reasons. The second one has a wow factor, but I like the simplicity of the first one. So, my vote would be for the first one. Both are nice, but #2 really rocks. Phyllis is terrific! I loved the 1st one, and then scrolled down to the second, and it was the winner! Love that it’s a more spacious too. Your house is pretty large, but it looks tiny from the front. #2 actually makes more of a statement and matches better with the size of the rest of your home. #1 is pretty, #2 is awesome! Without a doubt #2!! Great work Phyllis!!! While they are both beautiful, number 2 gets my vote! At first I was thinking option 1. I love how the porch extended to your office and the 4 columns gave the home a grand look. But, after looking at both I think I’d choose the second option. I agree the depth of the porch is best for Matt. Love the double gables, it visually heightens the home and looks open and welcoming. You seriously cannot go wrong with either choice! I’m curious to know which each of your picks were. It looks like a whole new home! Love how the austin stone is tied into the columns. Brilliant! A blank slate really is a fun canvas to work with! Phyllis did a fantastic job! I like number 2, with the double gables. Just looks so nice and gives a bit of architectural detail. I love both! But the first one is my favorite! Double gable (second rendering) … all the way! Love it. I’m partial to the second option with the double gable effect. It just adds more interest, in my view. What a lovely surprise to find in your mailbox. You have some terrific readers! While I love a hip roof (makes a house seem cozy to me) I prefer the hip over the entire house. In this case, I *love* the 2nd option. The double gables fit the style of the house and does make it look intentional and very balanced. I also prefer the size of the porch in the 2nd one. Nice job, Phyllis ! Wow!!! When I scrolled down to the first one my mouth dropped open. It is beautiful! But then I scrolled to the second one and it was unbelievably beautiful! I love both of them, but my favorite is the second one. Phyllis, you are so sweet to do this for Kristi. You certainly made her day. Thank you! The second one with the double gables get my vote..
No. 2 is my fav! Love that the porch is deeper and would look good with either a porch swing, or even a couple of rocking chairs and side table. The siding is brought over, just beautiful. LOVE the Double Gable!!! Totally balanced! I prefer #1 which gives the house more character and “strength”. The columns are in “harmony” with the 2 big trees on each side of the house. Second option; double gable! Great job Phyllis. Second one, double gable gives more definition and ties the stone siding combo together for a better blend. Both designs are transformational; however, the second one adds more depth, and It is the one I prefer. Option 2 – the double gable speaks to me most. But it’s your house! Pick the one you love! Not personally a fan of the tapered columns. I like the stone bases, but the tapered columns just feel out of place to me somehow. I love the one with the double gables! It adds so much more character and balance. #2’s beautiful, some of the lines similar to the Porchco photo from Tracy a few blogs back. I believe the second option balances the house more evenly and the height of the gables gives your house a “grander” curb appeal. The second is my favorite! Adds a great craftsman feel to the house. The second one. I like how she combined the siding element and the stone together. It ties everything together. The double gables gives it that substantial look. I like the double gable roof but I like the longer porch that includes your office. I like the second one with the double gable. It evens out the house. Now the front door looks centered and prominent, welcoming. Love the cozy porch. you could have rockers and a swing. plants/flowers on the porch. My additional un asked for 2 cents: I always like an entry way to be its own section. I never like to just walk into a living room. Its nice to have an entryway where you can have a place to hang a coat or leave your keys. i know you have that on the side but when you walk in front door you enter to the backs of couches. i’m just wondering if there is a way to separate the entry way. Great job Phyllis, I like #2. Love, love the second one. Great work Phyllis. Love them both but have a preference for the second one. I like Option B better. It just looks more natural, less busy to me. Plus I would think that having a wider porch woul be more comfortable for Matt. And if you put a bench or chairs out there, they would be recessed enough to (hopefully) have a chance of staying dry during some of the monsoon rain that Texas gets. Of course, I also think an outdoor ceiling fan would be ideal up there so you could enjoy some evenings on the porch. Truthfully though, either option is wonderful! And the use of the stone on the columns…genius! Number two. I am drawn to the differences in depth on the elevation. Both are awesome, but the double gable is my favorite. 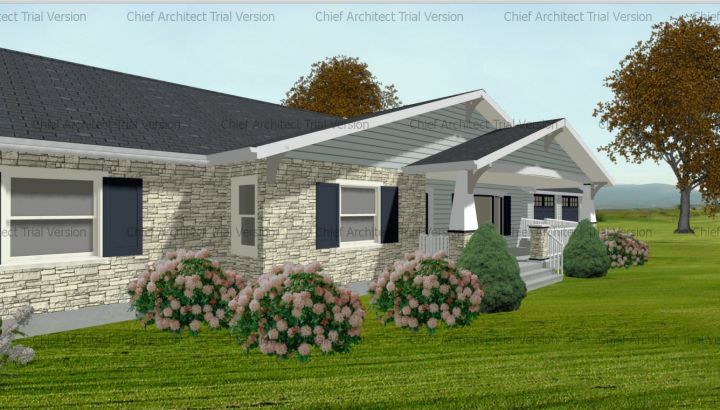 With the hip roof, the stone on the front of the office still seems severely out of balance and overbearing. The double gable seems much more balanced. I love the craftsman details! The second one makes your house seem much bigger because of the grand entrance! That is my preference. I am all over number 2! Love it. Just like everyone else – #2 is my choice! The deep porch is what draws me in! Phyllis is WONDERFUL!!!! I need her info because I’m designing my retirement little house right now!!!! Oh, I love the second one! No. 2 – so your office can take advantage of the natural light that will come in the window!! 2nd one! It actually makes the house not look so ranch – more cottage/bungalow. Phyllis is a blessing! 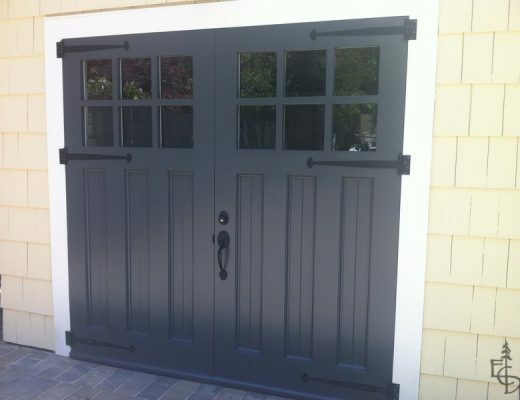 I like the second one as well…..are you planning on keeping both front doors? Seems a little confusing to me. I would just keep the one facing the street…. In the Craftsman style there were frequently two entrances from the front porch. I lived in one as a child and my bedroom had the door to the front porch. I loved it and it provided extra cross-ventilation. #2, love the bigger front porch. They are both lovely – but I like the second one best. The double gable makes your house look so much larger! I feel that #1 gives balance and symmetry and although #2 is also beautiful, it feels like everything slid to the right visually. I like the symmetry and classic look in the model house and that feels lost in both of these layouts. They layouts seem unbalanced (#2 is very top heavy). 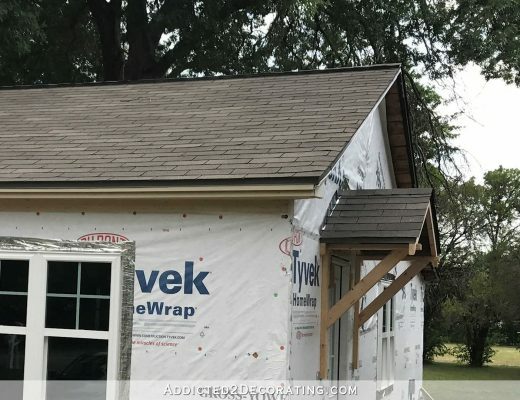 I would consider another option– doing one large center gable over your office and the front door and leaving the roof line on the right side of the house “as is” so that it is symmetrical with the left side of the house. I’m not sure if it would work or not but I would try it out. Good luck with your decision! Hi Amy–I acutally did a hand sketch of an option similar to what you suggested: put a gable over a porch in front of the office and door, and then have a sloping roof over the porch area in front of the living room–similar to the existing one, only I would suggest having the eaves the same height as the rest of the house (8′ I assume) and raise the entire porch roof up (actually just “scabbing” on over the existing roof–you don’t want to have to tear off the existing roof if you can help it!) and then raises up the roof from the back half of the house to meet the new, higher ridge point. It looked good in my sketch, and it would give you a very large porch, but would be more expensive and complicated structutally. I’m not sure what the budget is! However, I would love to try this in the 3-d cadd if I have time. There are so many options–so little time! Such a cool gift! Phyllis rocks. I vote double gable! I agree about the columns–Since I am just learning how to use the CAD program, I just used what they had available in the programs “library” of columns that had a separate base that I could apply the stone to.. They do look a bit “clunky”–the base of the upper part of the column should be a bit narrower that the stone base in real life, and have some bottom trim molding. I would definitely recommend that Kristi look at various option for not only the type and size and shape of the columns, but the different ways you can trim them out. I love the houses in the photos you linked to. Funny– I also had a hand-drawn sketch of a gable with an exposed timber truss, too, and mentioned double columns to Kristi as a possible option, too! (Great minds think alike!) The open gable with the exposed truss would let more light in! Way to go Phyllis, what a wonderful thing to do! *If I had to guess which one was your favorite, I’d say you like the second. Number one, the second one looks a little like a retirement home or business to me. The 2nd one. It just looks simpler, and more suited to an older home. It has both character and balance, and it has a larger porch, which should make maneuvering around easier for Matt. Kristi – You are truly blessed to have ‘friends’ you’ve never met but willing to go the extra mile. But, that only happens because you are who you are….a true and genuine person! I can only imagine your excitement when opening the email. Kudos to Phyllis for doing this. I LOVE the 2nd one. I like how the double gable looks plus since your office window is a different size than on the living room side it doesn’t seem out of place because of the nice porch and details over on that side of the door. I do like the color gray also for the house. Can’t wait to see which one you pick when you get to that part. I wish I could bankroll your remodel cause I love seeing what you are doing! Have a great Labor Day weekend and make sure to take some time to enjoy some ‘free’ time! I vote for option 1 …. UNLESS you want to have a full sitting area on the front porch. Then, option 2! #2 for sure. I loved the wheelchair ramp in that rendering. It looks more balanced that way. I like number two better…more open and inviting. I loved them both so you can’t go wrong either way. Phyllis was wonderful to do that for you. If put to a vote, I would choose #1 because the porch is wider – easier for Matt and easier to have some nice furniture placement out there, maybe even a porch swing? The second view gives better balance to the house. Anchors the house—it just went from $80k to $280k! Love them both, but #1 gets my vote! You are so lucky to have a friend like Phyllis – both are so pretty! Of the 2, I like the first one best. It makes your house look twice as big as the picture as it it now. I also think the roof over your office window will help with themperature control in the office. The second one is cute – like a little cottage. Second one is my personal fave but if price plays a factor then the most cost effective wins! And really either way is a WIN! I love them both, but #1 gets my vote. I love the hipped roof over the porch, but I really love the curved portico style roof over the stairs. I’ve always loved those arched portico’s. It gives it just a little more interest. Great job Phyllis. I wish I knew an architect! The second one also gets my vote! I personally like #2 best, but will it extend out too far to keep that giant tree? If so, then I would vote for #1. I wouldn’t do ANYthing to damage that beautiful tree. Phyllis is one great person! She did a fantastic job to help you put vision to the front of your home. You couldn’t go wrong with either one, but I like #2 the best. Such an inviting look. Now you really have an idea of where to go with this project. I’m excited for you! They are both gorgeous, i have to go with #2. You were concerned about one side being stone & the other side not being the same. I think #2 solves that problem for you, it doesnt look unbalanced. I have to admit that the pillars on #1 look fabulous!! I love the second one as it gives depth, character and definition! It makes your little house look so very big…. and actually both are awesome! What an awesome gift of visualizing the future of your little home! I love the 1st one. Being in the south, I believe you can never have too much front porch! Both of them are beautiful. I immediately loved the first one, because it was almost exactly the same as the one on my grandparents’ house. That house was sold a long time ago, and I have such nostalgia for it. But then I saw the second design, and my reaction was, “Wow! The double gable roof is *amazing*. And the extra depth is such a great thing to have to make the porch a terrific place to hang out. …I meant to put quotation marks after the “Wow”. 🙁 Now I’m so distracted; my brain is waiting for the close of the quotation. Definitely the second one with the wider porch! I like them both but my vote is for #2. I like it better because it appears to have more angles and dimension than the first. The first seems to be a little too linear and plain. How wonderful for Phyllis to do that for you! She did such a great job and gave you two beautiful options! I can’t say which I like better because both are beautiful and go with your home. Style wise, I don’t think you can go wrong with either one. I think it really boils down to how you plan on using your porch, how much light you want coming in and how much room you will need. I think that once you get furniture on it, a consideration will be if there is enough room for Matt to get around on it easily. I’m sure whichever one you go with, it will be beautiful, just like the rest of your home! I don’t have a preference. I love them both. Phyllis rocks the house!!! I went back and looked at them again and changed my mind….I like the 2nd style best. Thank you, Phyllis!!! You’ve still got it! 😉 Both your renderings are just beautiful, as well as being appropriate to the style of the home. Kristi, I vote for #2. While both are exquisite, I think the second one has a slightly less formal feel that makes it very appealing. But again, the decision could come to what the budget will allow. Either way, it’s a win-win! I LOVE the 2nd one for sure, changes the entire look from the front! I love the double gable version. I always wondered, ‘why have a front porch that is not functional?’ The double gable roof line gives you a whole other room to decorate and enjoy. Please let Phyllis know, for me, what a great job she did–on both versions. Good luck choosing!! I think the second one is the most interesting. It draws my attention to the front door, and seems more balanced. Love the stone bases on the pillars. The first one is classic, offers you some privacy on the front porch, if you want to sit out there. The second one is open and inviting. Love the double gable on the second one. It’s a tough choice, but I’d go for the second one. I really like the balance it gives. With the rock on one side and siding on the other, it makes it look fluid, like it was designed that way. And I like that the porch is a lot more open. With the center post not a full column to the ceiling it makes it feel much lighter and airier. Good luck with choosing! They are both very beautiful! I vote #2. It gives the exterior of the house a “grand” entrance. They are both great! I like the second one more because of the size of the porch. We are porch and yard people at out house! Print those off and tape them to the fridge to enjoy them everyday. Our fridge is also our photo gallery. I’m going to be no help because I like traits from both. 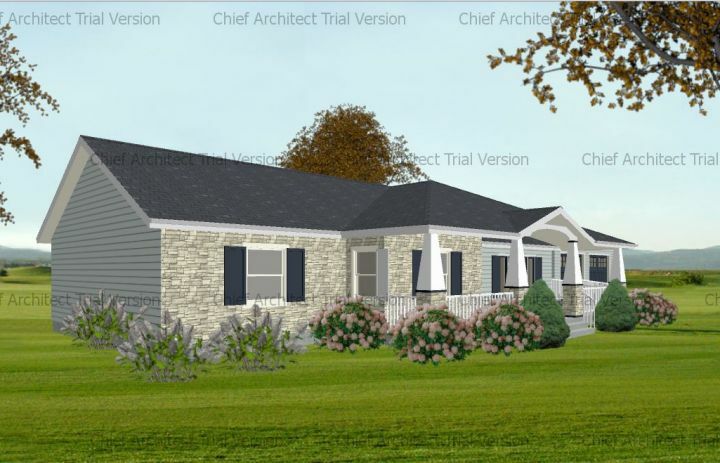 I like the single gable on the first rendering but I love how deep the front porch becomes with the second. I like the look of the single gable better than the double. Could you have the depth of the porch the 2nd drawing gives with the look of the 1st one? And kudos to Phyllis for doing that for you! 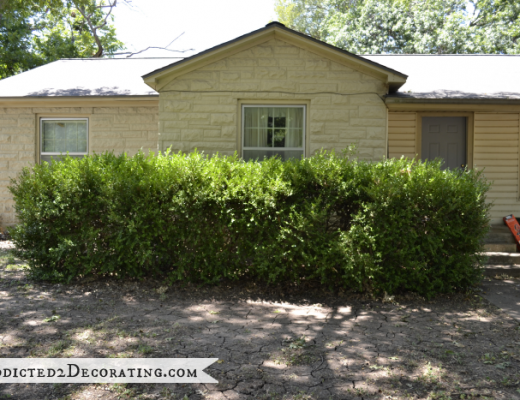 I like #1 but i think the stone and siding should be placed differently…. like the stone going half way up the side of the house all the way around the house and the siding from there up. Hi — Civil Engineer here. I like the function and utility of choice 1 far better than choice 2. I like the look of choice 2 better –and I suspect it will cost noticeably more than choice 1. So…if you plan to use this porch, pick 1. If you mostly want to make your house look far nicer, and don’t care about a few thousand more, pick 2. To help decide, block out rough dimensions and arrange borrowed lawn furniture — perhaps even with bedsheet canopies overhead to simulate the roof/ceiling. I strongly suspect that choice 1 will give you more utility and flexibility to include things like a daybed — if that interests you! —or screen off one of the two sides. Good luck choosing – both are good options! That was awesome of Phyllis! I vote for the second design, with the double gable, because the porch is more open and inviting. Scond one for sure! It looks more appropriate fort he area and style of the house. The first looks like it’s trying to be a lake house. Love ’em both but Option 2 is my favorite simply because it is more interesting. I suspect it will be more expensive to build that one but I still prefer it. Oh boy, it is a tough call, Phyliis did a marvelous job with both options. I am leaning towards #2, I feel it gives Matt more room, it appears more welcoming and I think it would be a fun spot to decorate. I much prefer the second one because it looks as if the house was always like this, while the first one looks like a ranch house that’s been converted. How awesome of her to do that! I really like both, but I think #2 is the best! Can’t wait to see which one you and Matt choose. Oh my, the second one is my f-a-v-o-r-i-t-e! Wow! This is a tough choice. I love both of them but will have to say I think I like the Gabled roof/porch. I think it looks more “open” and bright. Anyway, either of them will look great! Kristi, Both are beautiful but the second one is my favorite. I prefer the double gable. I think it seems more balanced and anchors the house better. That being said, since Matt pretty much let’s you do what you want with the design of your home, you might give him this one. I love seeing what all you accomplish. Your kitchen is going to be beautiful. My first time on commenting on any blog. Just want to say how much I love your site and can’t wait to read it everyday. You have inspired me. Thank you!! I love the second house the best. I love the deep porch and the double gables. Would be perfect for a porch swing. I LOVE the second one, it looks so intentional and completely changes the look and feel of the house. The second one is lovely – that’s what I would choose. No. 2. Can’t wait for you to sell the condo and have that money to start on projects like this. Keep up the good work. Do you ever sleep? The second is my choice. The double gable one has my vote. It just seemed more visually interesting and broke up the long low look to the house. Option 1 seems to enhance that. Both designs are awesome, but I prefer the second one best. It just feels more balanced. I vote for the second one. Love the look and that the porch is bigger. Perfect place for a porch swing! Number 2 with a swing and a big iced tea! I haven’t read any of the comments yet because I did not want to be influenced by the majority which ever that is! They are both lovely, but after looking at them several times, I think I prefer #2. Both are very nice and will make your house look awesome and welcoming. I’m going to be a “Sad Sack” here and warn you about the potential problem of changing the roof line. 15 years ago we added 16 feet the entire length of our ranch style house. The peak (is that called the hip?) of the original roof runs east to west and the peak of the addition runs north to south (Are you getting the idea of what it looks like?) We have had nothing but trouble with that roof ever since. Over the years we have had 4 different contractors up on that roof to try to address the issues. We are at the point where if we do anything else it will be to tear the whole roof off, including some rafters, and start over. Also originally the house had a slab front porch. We thought it would be wonderful to have a roof put on it so we could enter the house with standing in the weather. That was okay until my husband decided to make it a sun room. Even though the porch has windows on 3 sides and the living room windows look into the sun room, we have effectively blocked out all the natural lighting to the living room. We really truly have to have the lights on in that room even on the sunniest day! The 2 bedrooms that face the same as the living room are bright and airy, the living room is a dark cave. Just something to think about and get an opinion on before you start. Love your blog. Read it everyday and get inspiration from it. I prefer the double gable. It looks absolutely gorgeous and perfect to me. What a very sweet and thoughtful thing for Phyllis to do for you. Yay, I have internet today, just in time to give an opinion- ha! I like the extra porch area on the first, but like the looks of the second one best. It gives more oomph, which ties in with all the “wow” you’ve created inside. Love love love the second/double gable option. It looks more balanced, open, inviting, and helps me focus on the entry and porch, rather than POSTS as I do in the first. Number 2 hands down is my favorite. The 2nd. I didn’t even have to think about it. Love the double gabled one!! I like them both, but my favorite is #2. So pretty! Either would look fabulous. What an amazing job she did. A true blessing. I’m loving the look of the Double Gable option! It looks so spacious, and while not completely symmetrical, it looks so balanced! Great job, Phyllis! Just love the double gables! It adds visual height and breaks up the long expense of roof. I also think it was great that she “painted” all the doors black to match the inside of the home. Now if you could find a contractor to build it for some great publicity on your blog you would be all set. Wow, what gorgeous designs! 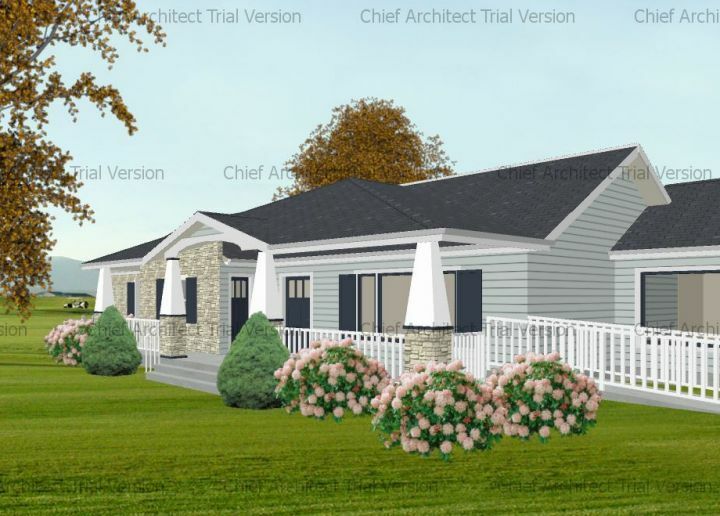 The 2nd design is my absolute favorite with that double gable, love it! I love them both, but I’d choose #2. Of those 2 options, the first one tends to accentuate the width of the house, while the second one brings the eye up more so that the house feels more like a 2-story than a ranch. They’re both gorgeous!! The 2nd set of plans. Very balanced and good incorporation of the Austin stone and the siding. I really like both of them. Something to take in to consideration is furniture and/or decorations on your porch and Matt’s ability to maneuver his chair. With option 1 you have the small porch area in front of your office where you could have furniture and/or decor and it wouldn’t interfere with the wheelchair. Just a thought. I love the second option. The extra space on the front porch will be a great place for a small get together, or dinner for two. The double gables do balance the house more as well as the stone on the columns. Both are great, but the hip roof just doesn’t seem to accentuate the house as the gables do. Both are beautiful, however my vote would be for #2. I was wondering could the roof extend over the entire ramp walkway for Matt? The larger porch is very welcoming & if by chance you had others visitors in wheelchairs it could accomadate all. Very nice of Phyllis…wtg! I felt your joy & rejoice with you! Love them both but the 2nd one really makes your house look elegant. Keep up the good work both of you ladies!! I really like the 2nd design. Wow–I am so glad to see the response to these CAD drawings! There are so many tweaks to them I’d make if I had more time to play around with the program and figure it out–like how to put in the correct kind of ceiling/soffit underneath the roof of the hipped roof version! (I can see that you must have fixed a few of the cad flaws with Photoshop, Kristi–thanks!) It was so much fun playing with this program. But hang on to your hats, folks—I had another idea for Kristi’s porch that just might make both and Kristi and Matt happy! I had wanted to try combining the smaller entry gable and columns from the hipped roof version onto the double gable version (making it a triple gable!) I would put it right on the left side (as you are looking at the house), in front of the door and steps. That would give the footprint of the porch a slight (maybe 2′?) bump out there (to give a reason for the extra gable!) If you think that you might like to see that, maybe I can try to work up that option this weekend . What do you all think? I prefer #2 as I don’t think the added porch area would be all that useful plus the loss of natural light into your office I wouldn’t care for. Both are beautiful, #2 more functional IMO. As beautiful as both drawings are, no. 2 gets my vote, it’s less busy, you don’t want to detract too much from the originality of your house, as it is a beautiful original building!!!! Both look great, but I prefer the second one. Either choice will be beautiful. I don’t think you can go wrong. Both options are lovely. But, I do have a clear favorite. My vote is for #1. Wow! Awesome job Phyllis!! It’s a tough call but number one is my favorite! Both beautiful, but #2 is my favorite. Good job, Phyllis! It looks like what the house would choose and makes the most of what you already have. I lived in Denver, CO for 5 years and there are lots of craftsman houses out there. I think they have such character. Can’t wait to find out which were your and Matt’s faves! I say do both!! I would incorporate both plans into one great porch with two gables! On the second plan I would extend the porch to the left as in the first plan with maybe a pergola in front of your office. There’s nothing like a big porch. Just think what you could do with all your design talents. I love the second one….with two gables!! They are both lovely! However the second just “feels” right. I also like the idea of tying in the siding on the gable. I like how the porch doesn’t overpower the house, but seems to open it up more. I also love asymmetrical architecture, so the second one wins. Personally I love the more casual look of #2. However, with the elegance that you have just put in your kitchen with that marvelous deep green along with the gold leaf, I think you should go with #1 which is way more elegant. Both are nice but the 2nd is best, IMHO 🙂 I liked it best right away, but wasn’t sure why until I finished reading the post. It’s because of the reasons you stated: the blue siding on the larger gable as well as the smaller front one, and the stone base to the columns, really tie things together so well. It also seems to have more of a presence, if you know what I mean? More substantial is another phrase that comes to mind. Obviously I’m having trouble articulating why, I simply like the 2nd one a whole lot better! That was soooo nice of Phyllis! I love the second one. Both nice but the second one would be my choice. I like No 1 and i enjoy the work you are doing on your house.. I love the second one! The gables look intentional and the deep front porch would be amazing. 2nd! But how awesome is Phyllis to do this for you!! Both look great, I just prefer the height of #2. I love them both, but if I had to choose, it would the 2nd design. Not reading any comments yet so I won’t be swayed! My official vote is for the second version. How nice of Phyllis to do that for you…what a generous and thoughtful gift! You have great followers and you just pull us in with your talent. Thanks for always sharing with us. Both are very nice, but I prefer the second option! Double Gable! I also love the first one, but I think the double gable plan is in keeping with the original house design while pulling all the elements together for better balance. And for some reason it looks less busy to me. The first plan/version is a beautiful remodel. The second “double gable’ plan looks like the house was built that way from the beginning. I love the double gable look! The second option is my favorite, but both are beautiful! Thanks for sharing your home and adventures with us – can’t wait to see what you do next! I like #1 – mainly its the big front porch. being from the deep south we love our porches. the craftsman columns are wonderful. Wow! Kudos to Phyllis. Both look awesome, but I do really drool over the second option. It’d be a hard decision to make. What wonderful drawings that really bring the front of your house to life! I love #2. It gives the house such presence and really makes it contend with that great big shade tree rather feeling so dwarfed. Having a large porch to sit out and enjoy your neighborhood and the shade to keep you cool is a perfect combination. It just makes the house FEEL so much bigger and more grand and isn’t that what curb appeal is all about?!! Talk about a slew of opinions. So here’s mine. The second porch is pretty, but the stone post with no column on top sort of throws me off. The reason the first one is my favorite has nothing to do with how pretty it is. The more porch you have shading your house from that Texas sun, the more comfortable your house will be, climate wise. I would choose the bigger porch just to reduce the cooling bill. I love the second one so much!! It looks more natural to me! Double gable has my vote! #2 for sure. Although #1 has much to recommend it, I prefer the double gable with siding to the expanse of roofing shingles. I’m in the minority, while I think both are georgeous, I prefer the first one. Seems to fit the style of the house better. Phyllis rocks! Love them both and I mean it! i can’t pick a favorite haha. Good on ya for having the votes to help you Kristi because I seriously wouldnt be able to pick on my own if i were you. I honestly cannot choose. Just to have a porch like that . Very awesome of Phylis to do this! Trés bonne Karma! While #2 does look more grand, it will most likely be the more expensive option. It’s has a much larger span between columns and is deeper. Option #1 seems more bungalow or arts & craft era, which may fit your home’s style better. They are both nice, but I think I’m drawn towards #2 because it’s more open. However you might price out both and see if money doesn’t help drive your decision. My preference is the first one! Although, I like the second one too, the reason I like the first one is because of the added coverage over your office window. This will help keep the room cooler too. But I just love the options you have with the much larger porch!! So # 1 it is for me!! I really don’t know which one I like better. I like both of them! I. Just. Don’t. Know. #2 because it just seems to yank me up the sidewalk and invite me into the house. Go, Phyllis! Ok, I might be outnumbered here, but I really like the first one. Seems to give you a great porch option and tie in the existing proportions of the house and the rooflines. Plus, the hip roof is very unique. I like option #2. I think you would like a wider porch. It would let you have a nice sitting area, maybe including a swing. I prefer the second one. Your house currently presents as a small ranch house from the street, although it’s really quite spacious in its layout. The second facade is more true to that layout, in that it presents as the more spacious house that it is. If the budget were to allow it, you could use more of the stone on the facade of the section surrounding the breakfast room window. That would pull that material further to the right in the design. The 4 columns in version #1 seem a bit busy to me. So, like I said, I like both ideas but I love WIDE porches but also love the two gables. I love #2. It looks more like a part of the houses style instead of an afterthought. I’m from east Texas and this style is very prevalent in this area. Such a generous gift of the 2 designs for you! My favorite is #1…..
My favorite is #2. I think the ramp integrates better. And I love that deep porch. Also, when I scrolled down and saw it, I actually said “Oooooh!” out loud. I started to read all of the comments but there were too many! 🙂 There’s definitely a favorite that has emerged and I must say, I concur. Phyllis, that was incredibly generous of you! BOTH are beautiful, however, like most, I prefer #2. One of the reasons that I prefer #2, besides asthetics, was that Matt would have more space to maneuver. #2!!!! what an exciting email to receive!! Beautiful options. I like #2 the best also, as long as the top of the front door is square; it looks a little rounded off but that may just be distortion. So glad the Austin stone is still there and not painted! What a treat to have an architect reading your blog! I prefer her second option, personally. I vote for #2. It gives more height to the house and it looks more balanced/proportionate with the garage. I like number 2 best love the double gables and the deeper porch more room for chairs to sit! I vote for the second one with the double gables. LOVE IT!! I LOVE option #2! Great work Phyllis!! How wonderful of Phylis to give you this gift. A generous and caring woman. My favourite of the two is the double gable pic. I was so sorry to read about the your cupboards getting wet in the rain. How disappointing. I love your blog and can’t wait to see what you do next. You are incredibly inspiring to me as I am HOPELESS at any kind of DIY. I love the second one! I’m super happy that she kept the stone on both! The columns and the extra porch next to your office win me out on #1. But both are beautiful and something I’m excited to see rendered on your home. Gorgeous work! Both are fabulous, but my personal favorite is #2!!! #2 – love the double gables!! I like both of them, so I am no help…I just wanted to say KUDO’s to Phyllis and I am in LOVE with the landscaping!! !